Seth is the bestselling author of Linchpin, Purple Cow, Tribes and many more books and is known as one of the world's biggest thinkers in communities such as TED and the Direct Marketing Association. This year he is being inducted into the Marketing Hall of Fame. And did I mention he writes one of the most popular blogs in the world? Seth and me in front of his not-so-curated bookshelf. In this interview we discuss where Seth sees publishing going and his thoughts on the changes we're seeing in how people read and spend time. Seth shares his opinions on blurbs, acknowledgments, and his unique perspective on work-life balance. He also gives insights into how we can change our own world by changing the narrative inside our heads. And that's just a taste. I sat in Seth's studio transfixed, mesmerized, and hypnotized by one of the world's best brains. 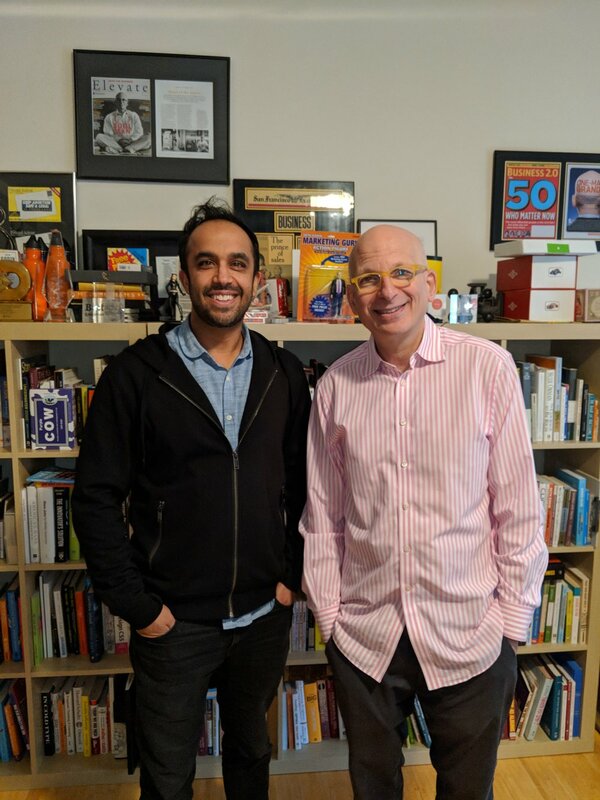 Big thank you to the kind, generous, and indispensable ... Seth Godin. What strange lesson did Seth learn when he gave away 3000 of his own books? How and why does Seth think the publishing industry is a mess? How does Amazon and the “long tail” change the game? What counterintuitive benefit does Seth see in book blurbs? How do we change our world by changing the story we're telling ourselves? What framework does Seth use to decide which "lines of business" he monetizes? Which of Seth's books did The Tipping Point inspire? How did Seth discover his ultimate mission ... and what is it? Why does Seth think work/life balance is a lie?